Following up on this old feature request. We are using a quite advanced item-set in out article type, to create rich articles with all sorts of content blocks. 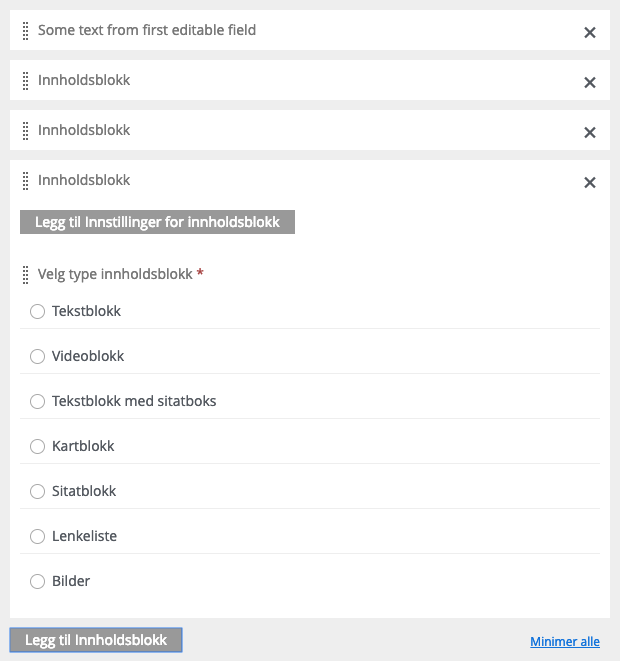 Trying to keep track of the different blocks is quite cumbersome, as the titles are non exisitent while editing, and they show some text from the first editable field once the article is saved and reopened/page reloaded. The answer from @ase mentions that “Later on you will be able to manage the header title yourself.” Any chance of bumping this feature? Anything is helpful here. Live changing the header, or on onBlur, would be great. Also, the possibility to control how the title is created. In our case, it’s possibly a bit tricky, as each item in the item-set is again an option-set (text block, video block, map block etc). Ideally we could set some prefix in these options that could populate the header of the item. But any kind of live-ish update or control over the header would be appreciated. BTW, a “expand/collapse all” link at the top of the list (as well as the one on the bottom) would also be highly appreciated. The first text field within an item set should automatically show up as title. Think this feature was added to 6.15! Ah… I see now you are already using this feature, but it does not apply to the optionset inside? We’ll look into our opitons here. For 7.0 we are testing out template literals for a similar use-case, maybe it could be used here as well? It works well indeed with any editable field within the option set inside. However, my request is more one of being able to override/customise it somehow. In the case of no editable fields within the scope, for instance. We have several blocks with only content selectors within them, where the header only gets the default text. Also, the header doesn’t update until the entire page is reloaded. Would be great with at least update on save, on onBlur, or even live.